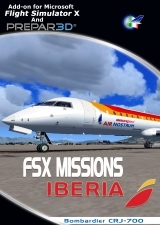 TSS is proud to announce the release of the TSS Boeing 727 JT8D Soundpack for FS2004. With this soundpack,we have captured all the best Boeing 727 sounds, and put them together, to combine a truly stunning representation of the Boeing 727 family. We have made the cockpit sound a little more audiable, and made the external`s roar!!! Good old lady has been brought back to life. PLEASE NOTE : The preview video has lower soundquality than the actual soundpack. The Boeing 727 is a mid-size, narrow-body, three-engine commercial jet airliner. The 727's fuselage has an outer diameter of 148 inches (3.8 m). This allows six-abreast seating (three per side) and a single central access walkway when coach-class (18 inch width) seats are installed. The first Boeing 727 flew in 1963 and for over a decade was the most produced commercial jet airliner in the world. A total of 1,831 727s were delivered. The 727's sales record for the most jet airliners ever sold was broken in the early 1990s by its younger stablemate, the Boeing 737. In November 2007, there were a total of 76 Boeing 727-100 aircraft and 356 727-200 aircraft in airline service.